Canon has pushed out refreshed versions of its compacts and a couple of camcorders for CES this year with several improvements across the board. The Vlogger-friendly Canon Legria mini that launched last year has been regenerated into the Canon Legria mini X with Canon claiming that improved audio quality is the key differentiator. A built-in stereo microphone has been added, covered with a two-layer mesh cloth and sponge that, Canon says, reduces background noise and static. The Japanese company has also added new terminals for headphones and external microphones which should prove useful if you plan on using the device to interview people. 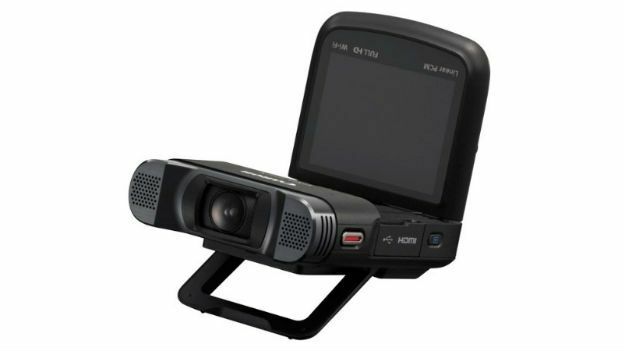 It retains the flexible 2.7-inch touchscreen and the f/2.8 170-degree ultra-wide angle lens from last year and supports both AVCHD and MP4 recording for 1080i and 1080p respectively. Elsewhere, the Canon PowerShot N has also been reborn as the Canon PowerShot N100. It keeps the flippable 3-inch touchscreen from the previous model, but now Canon has added a rear-facing camera. The expectation being that shooters will be able to capture their own expressions at the same time as their subject. The dual-camera approach has been employed in smartphones for a while now, but we're not sure we've seen it added to a traditional compact camera yet. Whether it'll prove a popular addition remains to be seen - but given that "selfie" was the word of 2013, we wouldn't bet against it. When it comes to bottom line specs, the PowerShot N100 features a 12MP CMOS sensor with a DIGIC 6 processor and a 5x f/1.8-5.7 optically stabalised lens. Rounding out the announcements are the new PowerShot SX600 HS - a 16MP point-and-shoot with built in Wifi and NFC - and the Legria HF R56 and Legria HF R506 camcorders. Both utilise a Canon 3.2MP Full HD CMOS sensor and DIGIC DV4 imaging platform.